You can find an overview of the program, including main track and side tracks, in the table below. Do not miss the opportunity to experience these exciting presentations and register to the EDF. The proceedings of the EDF2012 are published at CEUR Workshop Proceedings Vol. 877. They include papers and posters selected for presentation at the event. 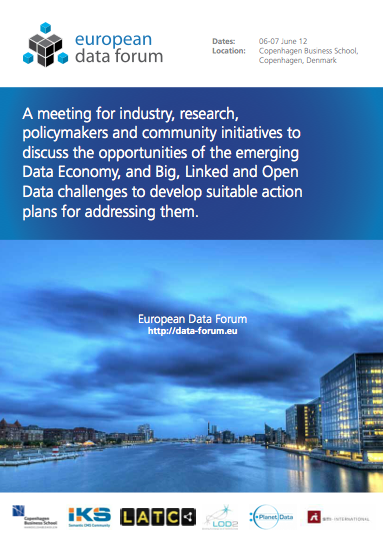 09:15 - 10:45 Kick-off: "SME Initiative on Digital Content"
"Leveraging the data potential in Europe"
Presentation of successful projects - Innovative ideas on how to use/reuse digital data pools. "From data-driven startup to large company in a decade"
"New trends in public service and Citizens Communication"
"The cloud, Big Data and Great Opportunities"
"Open Data, Open Database: PostgreSQL"
"Using LOD to share clean energy data and knowledge"
"Enabling open data interoperability - The case for the Core Business Vocabulary"
"Transparency and Open Data. Why bother?" "(Copy)right information in the digital age"
"How the Biggest Open Database of Companies was Built"
"FactForge: Data Service and the Value of Inferred Knowledge over LOD"
"Linking and Analyzing Big Data"
"Open Data: Where We Are and Where We're Going"
"http://data.fao.org - Uniting the data of the Food and Agriculture Organization of the United Nations (UNFAO)"
"Bringing Big Data to the Enterprise"
"SRBench - A Benchmark For Streaming RDF Storage Engines"
"Abstract Access Control Model for Dynamic RDF Datasets"
"Big Data Public Private Forum (BIG)"
"Future European activities and funding perspectives for SMEs"
The rooms plan can be found here or can be downloaded as PDF.